I have been thinking about poached eggs for a while now. 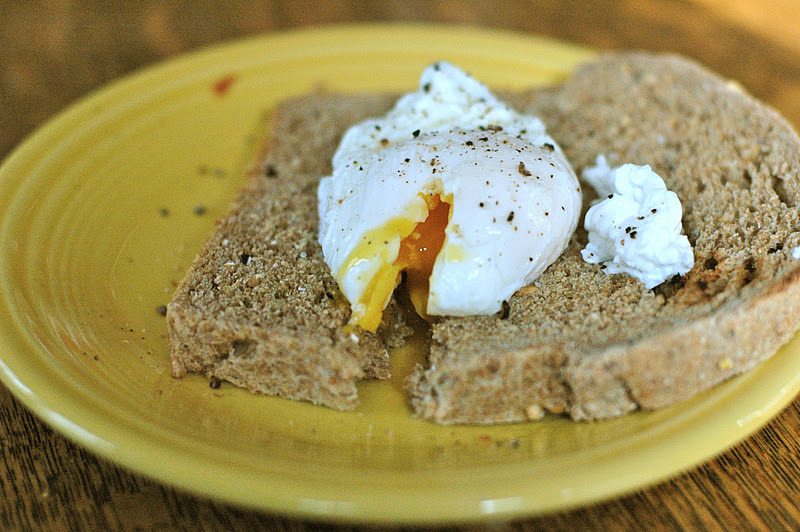 I grew up with limited experience with poached eggs. I remember the old aluminum egg-poaching pan with the 4-egg cups suspended on top that my grandmother would use. I remember Eggs Benedict – (english muffin, hollandaise sauce, and canadian bacon) being a special brunch menu item. And maybe more familiar to me was an Egg McMuffin (the non-classy version of Eggs Benedict). I had not thought about them in a long time. But I have been on an egg kick lately, as I find they are a great meat substitute in my kitchen and they are cheaper, faster and easier to prepare. And my whole family likes them. About a year ago I was at Marche´, the lovliest breakfast spot (in my opinion) and saw poached eggs on the menu and then saw them pass by on the plate in the server’s hand. They were served either placed on top of toast or over a bed of tossed greens with vinaigrette. 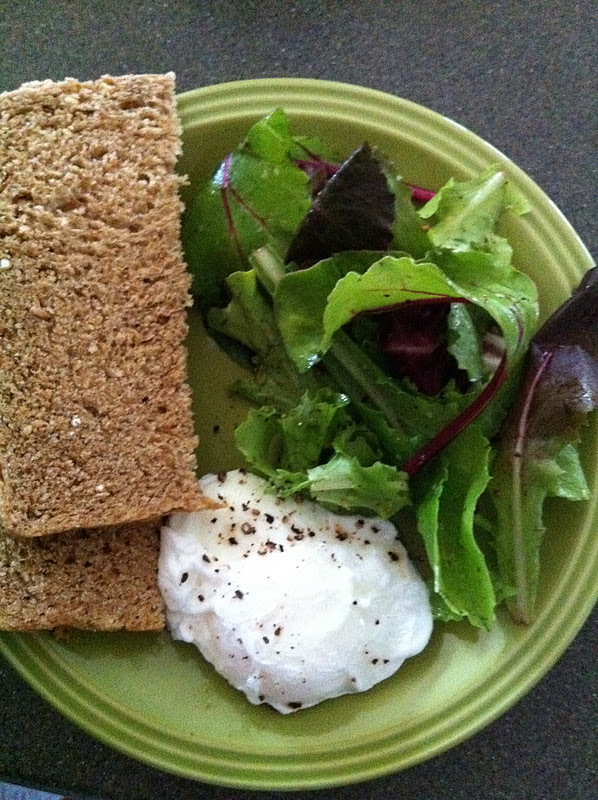 [It took me a minute to conceptualize an egg on a bed of lettuce. But I’ve since tried it and it is tasty! ] After that poached egg encounter, I began to see them different places, on pages of magazines, in cookbooks, on menus. And they weren’t the rounded poached egg pan shaped ones, but were more free-form, naturally shaped eggs. They were so pretty. I really wanted to try them. 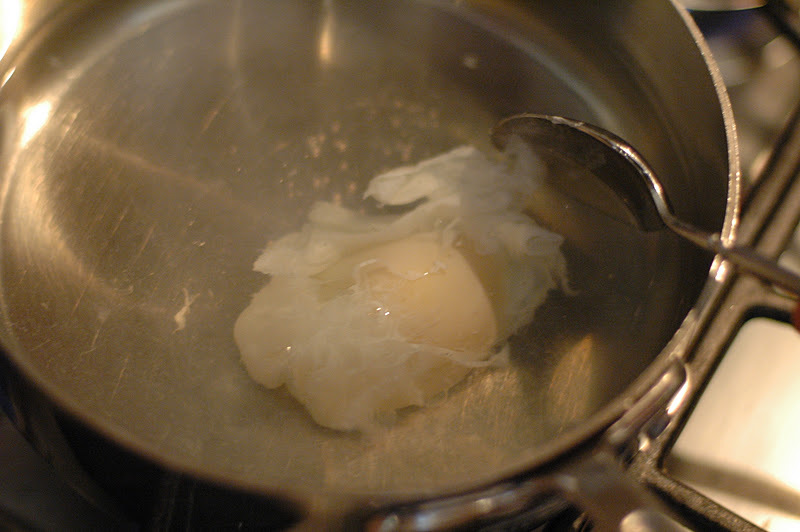 I began to dig around for the reason of why poached egg? What’s so great about it? 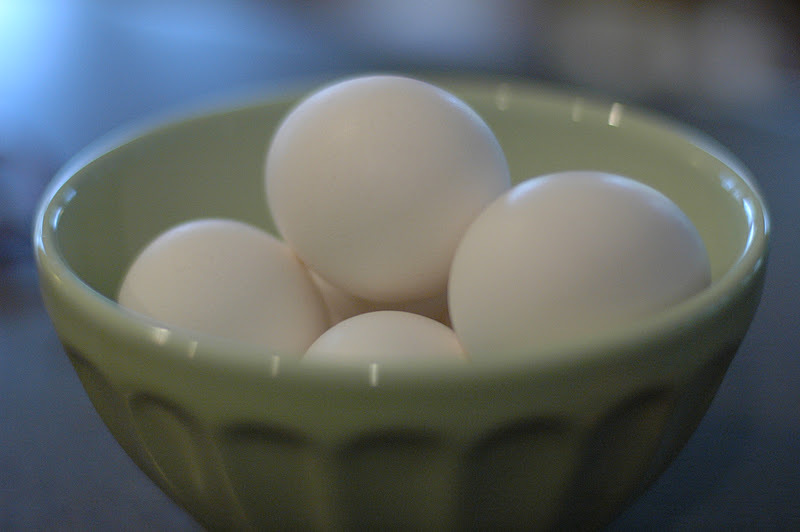 This is my conclusion: they are healthy, like boiled eggs, but with the creamy/more liquid center like a fried egg. I was curious and interested but thought I’d like some help to face my poached egg fears. [I would always choose to take risks with a partner, rather than brave it alone.] 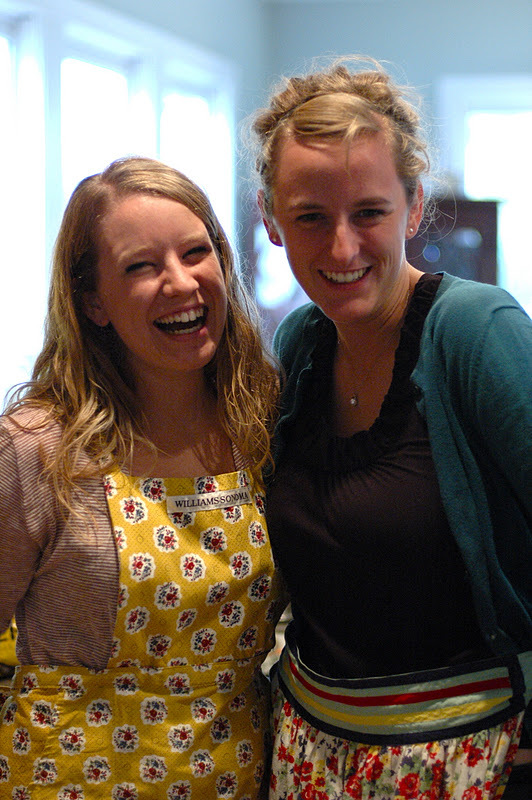 So, I found a couple of willing partners: Blair and Caroline, some scientific-smart-cooking pals. They made it much more fun and their nursing and chemistry backgrounds made discussing the physical properties and reactions much more official. So we got a bowl of eggs and a hearty loaf of bread from the bakery and The Cooking Lab began. I had done some research via the internet, and The Joy of Cooking, and there were some competing pieces of advice, so we decided to give it a try and see what worked for us. We tried to create independent variables, control groups, etc. We tried 3 pans at the same time. We charted out our plan and which variable we would alter for each pot. We labeled each experiment: B, C, and J– each corresponding with our first initials. As the eggs were poaching Caroline reminded us of the scene in Julie and Julia about egg poaching. I had forgotten about it! So, I ran and got my DVD and we watched that scene, which just added a little more fun to the entire experience. She had a terrible time making them work…much more than we did. Maybe that scene was buried in my subconscious contributing to my fear of this activity. Our first round included different techniques, the use of vinegar and not, and varying times of cooking, and the use of the “vortex”- swirling water technique. J lost a good amount of egg white, B looked strange, with a volcano looking top to it, (Dave entered the room and declared that it looked like a SNORK- a cartoon from his childhood, like this –>) and C was the best overall. 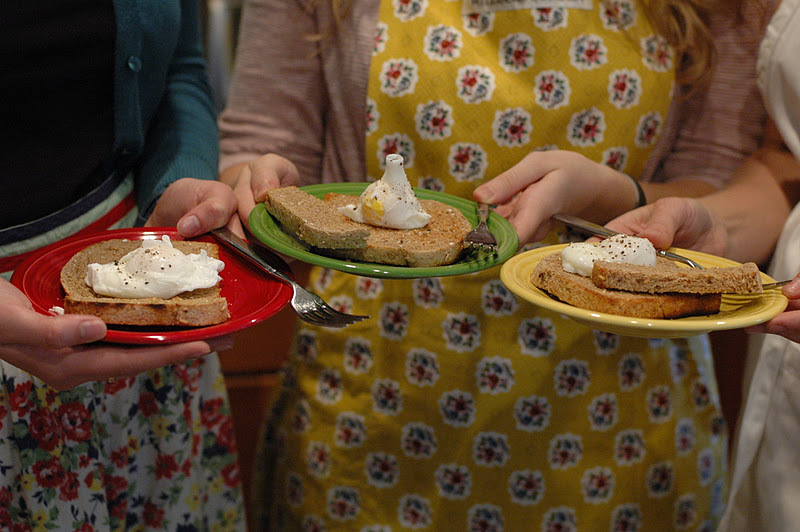 We sat with our eggs and whole grain toast and gobbled them up. We assessed the situation, evaluated each egg and made our plan for Round 2. Then we returned to the kitchen. This time we used vinegar in all of the pots and varied times a little, discovering that 5 minutes seems to be the best cooking time. This time all 3 were winners! Hooray for success! 1. 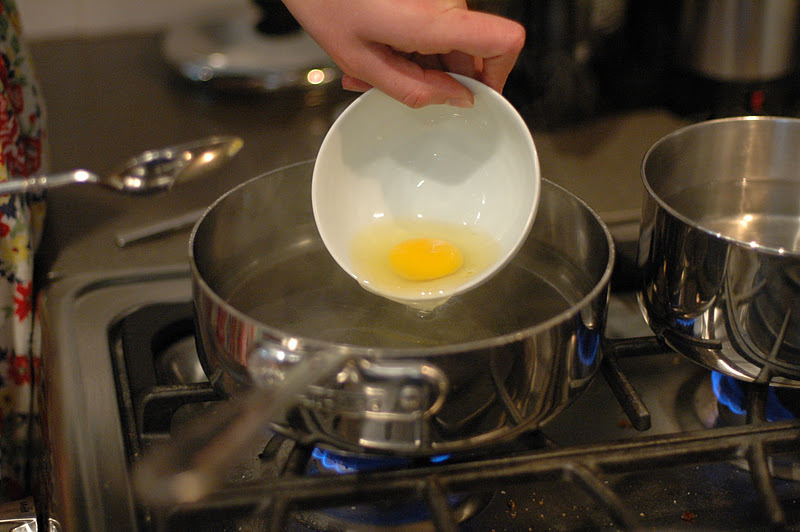 Crack an egg into a small prep bowl or ramekin. 2. Fill small pot half-full of water and 1 tsp. vinegar. 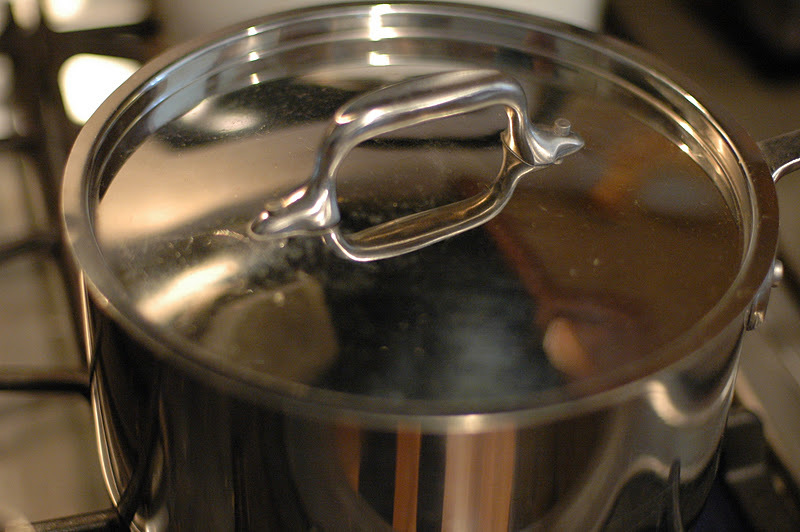 Place on High heat until water begins to ALMOST Boil. If it starts to boil, turn back the heat so that it is not boiling. the yolk of the egg. remove it from the burner. Set timer for 5 minutes. of the pan and onto a plate. And it’s amazing! Right there in the pan, free-form, and in just a few minutes! 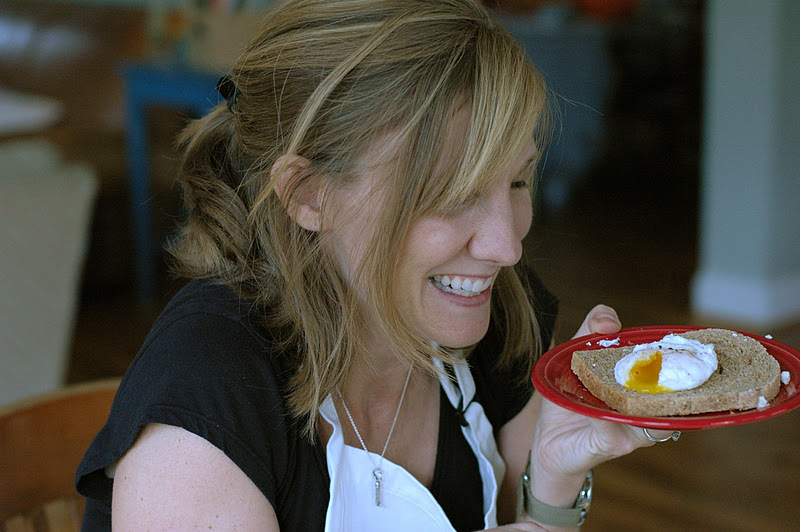 They are so tasty and fresh and beautiful and the yolk is gooey and rich. I have been making them for the past few weeks and my crew is loving them. multiple eggs at a time in one pot, and not loosing any egg white in the process. You are like my cooking lifesaver! I've been curious about poaching eggs for awhile because of a basil hollandaise sauce I had back home. I wanted to recreate the sauce and poach eggs to go with it. Maybe I'll give this a try tomorrow. Now we need a sauce! Do you have a hollandaise? Can't wait to try! Thanks for the tutorial! Our poached egg trick is to make a little whirlpool in the water first and drop the egg in to the center of the spinning water. That way the egg does not separate so much.